Last week in Flushing I picked up a couple of MG Gundams with the kids. Both kids know I will build models for them so the boy picked the HG Justice Gundam and the girl picked the HG Shiranui Akatsuki Gundam. I built his model first last time, so this time she gets her model before he does. 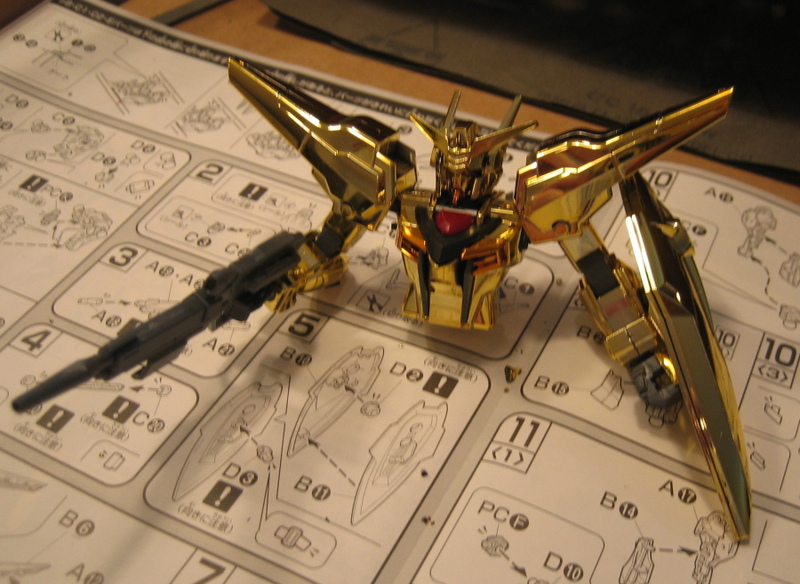 I should have learned from the last time I did a Gundam with shiny gloss finishing. I usually cut the parts from the spruce tree, trim the parts with a jewelers file and maybe sand the nub off. Not with shiny gold colored pieces. The file and sand paper leave scars. I have to cut off each piece with room to spare, trim the excess carefully with the side clippers, and then use an exacto knife to shave off what little is left. Without taking too much off or scratching the finish. I’m almost half way through and it is really tedious. I’ll post finished pictures once it is done. The model is shiny and it has seams everywhere. A “serious” Gunpla modeler would soak the model in a bleach and water mixture to remove the paint. Then you glue the seams together, mask it and re-paint. Lucky for me I’m not that serious.